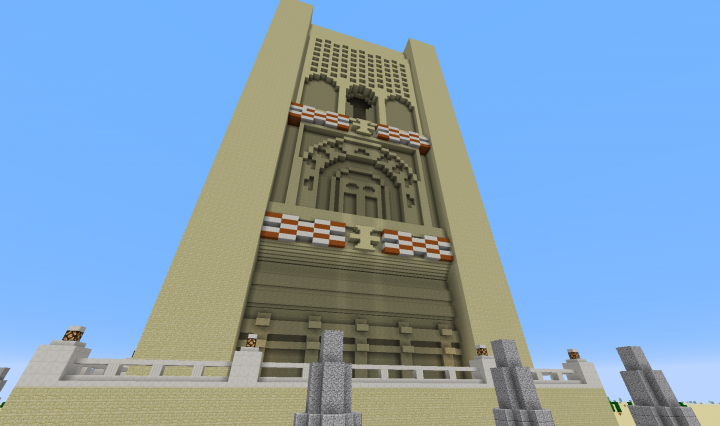 This project is a replica of the Berber World Wonder from the Age of Empires game by Microsoft with the add-on "African Kingdoms" in the team colour Orange. This represented the "Hassan Tower" in Rabat, Morocco. The tower was built from 1195-1199. 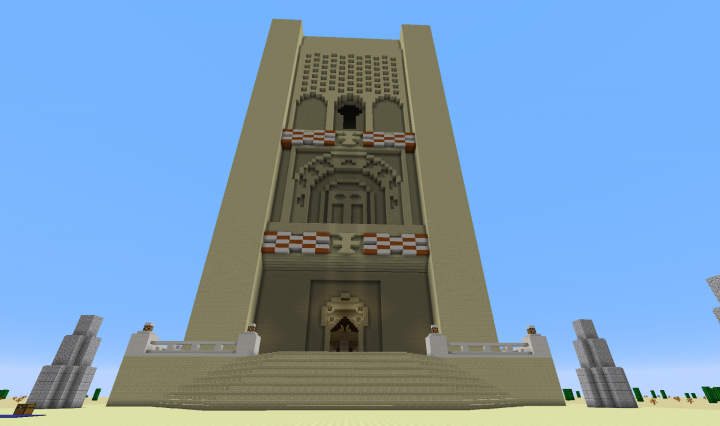 The construction of the Minecraft model began on 5 August and was completed in about a week and produced by me for the Skyscraper Solo Project Contest. Due to the fact that McEdit (at the time of construction) has no compatibility with the new 1.13 version I cannot upload a schematic for the World-Viewer nor could I simplify the construction. The entire structure therefore had to be piled up block by block by hand. 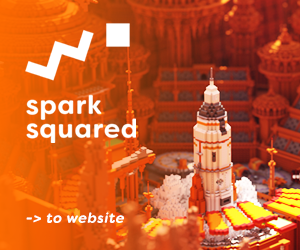 Due to the size, the use of structure blocks is not suitable and therefore cannot be exported to other worlds without interfering with the game file or considerable effort. I'm a big fan of the Age of Empires series, and have been trying to rebuild some of the AoE buildings in Minecraft, but (almost) none of them were presentable. 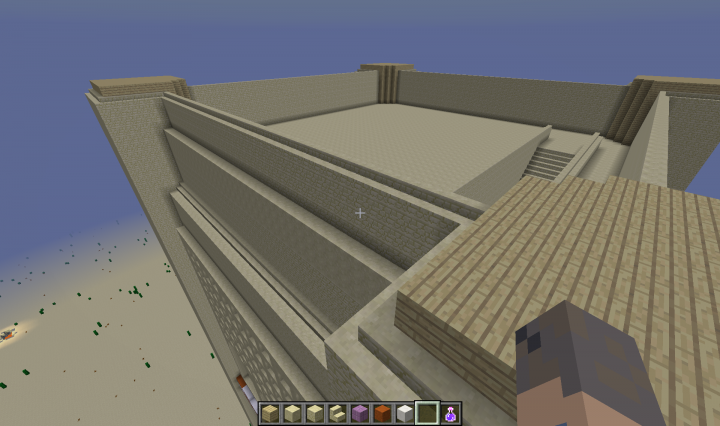 But over the years I got more experienced and after a few buildings I also tried AoE wonder of the world. The Hassan Tower was to become the minaret of the great Mosque of Rabat. In 1195, construction of the mosque and minaret began. Four years later, after the death of the Almohad Caliph "Abū Yusuf Ya'qūb al-Mansūr", the construction was stopped and never resumed. The minaret itself was not completed either. With a height of just 44 meters, just half of the planned height of 86 meters was reached. If it had been completed, this minaret would have been the greatest of its time. The construction freeze can be considered as a symbol for the setting Almohad Empire. Due to internal conflict in the Iberian Peninsula as well as external threats such as the imminent decisive phase of the Reconquista or the rising Abdalwadiden, the Almohad empire weakened itself further and also the city of Rabat became increasingly meaningless; which only changed after the Moroccan independence of France more than 800 years later. A big question during the construction was for me, what is the purpose of the building. For one thing, I have no use for a minaret in one of my cities. I did not want to make another lighthouse out of a minaret. 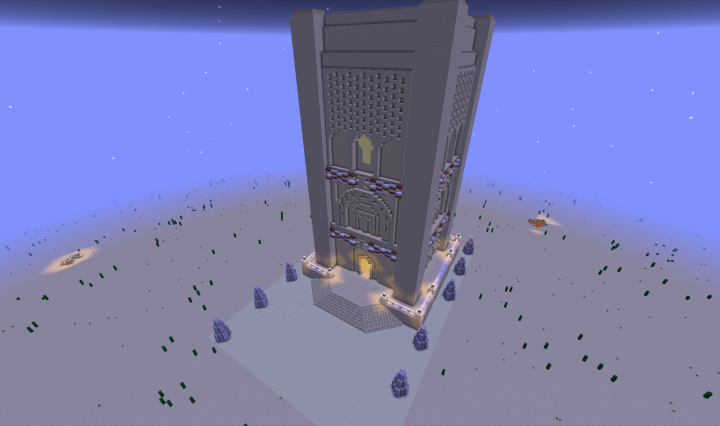 Finally, I came up with the idea to make an observatory out of the minaret. In addition to the wide staircase, the building has a library, a tour at the level of the keyhole-shaped window and a high entrance hall with an armillary sphere in the middle. The entire building has continuous electric lighting, which is operated by obvious buttons and levers. I really like Planet Minecraft's contests, but I decided not to take part in this because the title "Skyscrapers" already implies a modern building and modern buildings are just not my style. After all, I had seen that the age is not a limitation and I said, "Hey there you can still do something" and started to worry me. I either wanted to build something suitable, which I could then use in the RP world, or continue my hobby - the wonder of the world from AoE-II or AoM. Finally, I came up with four ideas. 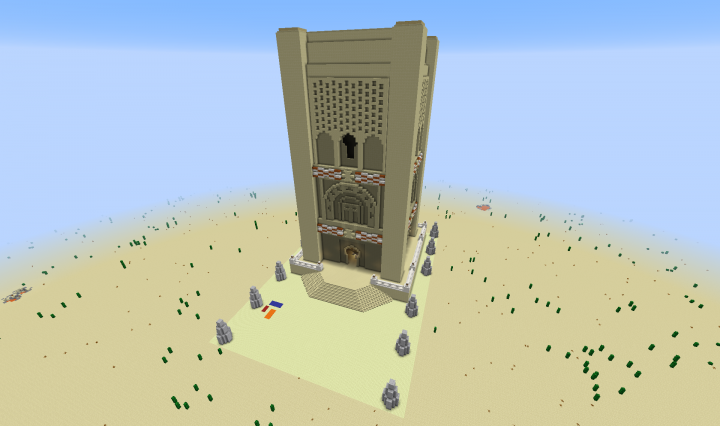 The AoE World Wonders of the Spaniards (Torro de Oro) and Berber (Hassan Tower), the Kronos' wonder of the world "Solar Clock Tower" from AoM or the Pharos of Alexandria. 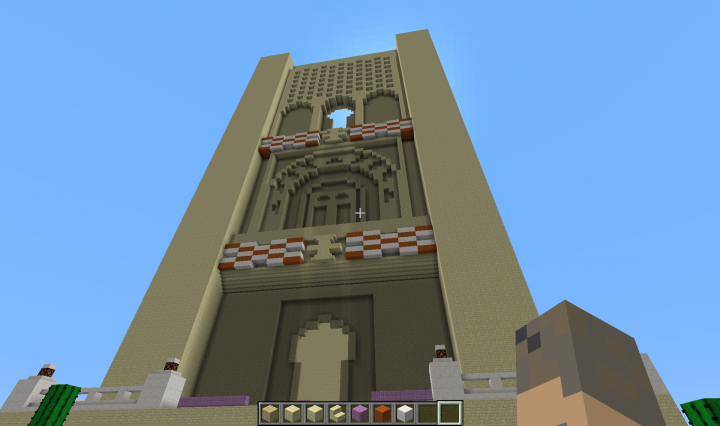 For aesthetic reasons, I decided that it will be either the Hassan Tower or the Pharos. Finally, I decided against the Pharos because this is needed in the RP world, but because of the above McEdit problem I cannot build it on another world and then import it. At first, I started planning the foundation. For this building, I simply built it without building sketch and decided from the gut for the dimensions 70x70 for the foundation. 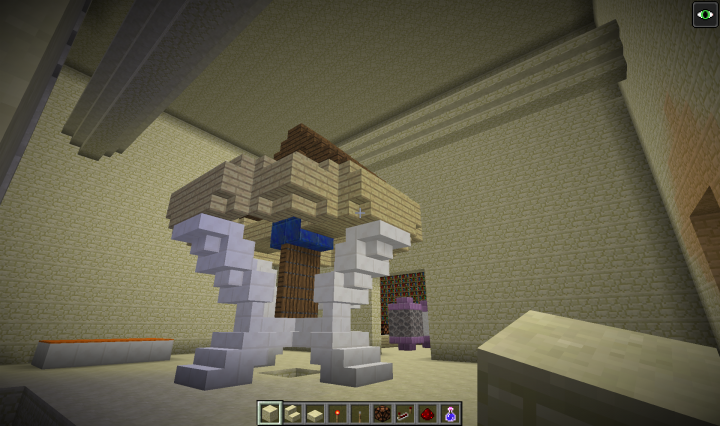 Without McEdit, it was not easy to make sure the skeleton was truly a square. In order to do that, I built diagonal markers with pupil blocks to make sure that I have a square. Then the foundation was raised to a height of seven blocks and then built the outer tour and the striking white railing. After the first phase, it was about the foundations in the inner area of ​​60x60 set. The main problem was to determine how deep the wall must go from the corners, so that later enough there is still enough space for outgoing decoration mosaics and decorations. Afterwards, the floor plan was built upwards to a height of 100 blocks. The entrance is a very high rectangle. The difficulty here was that by setting the height, I also set the proportions of the entire building upwards. It was more of a gut decision than what was calculated. This phase involved the part between the lower orange X and the arch part. Although I did not choose the X very high, I decided to build it succinctly so that it grew out of the wall. I had increased this width more than once. The real problem, however, was the bows above. 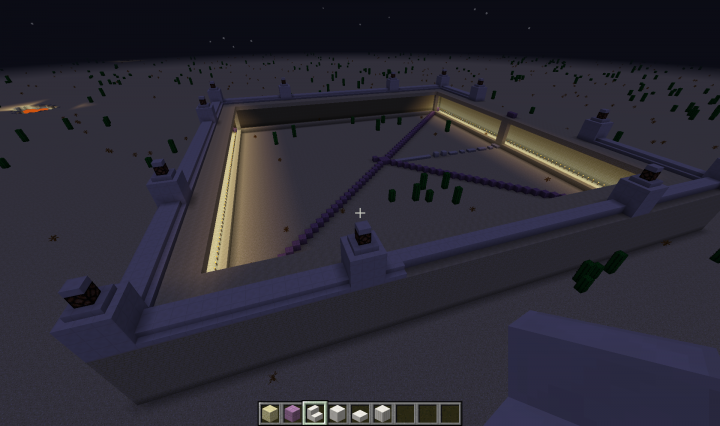 On the AoE model you can clearly see different levels and "holes", so you had to work very neatly. In the end, the built was transferred to all other sites. 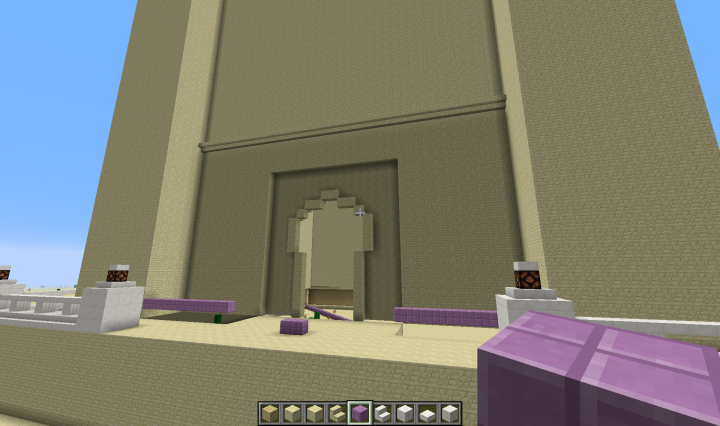 The three arches and the window was relatively simple. I could build the X-spot as below but the holes at the upper end in front of the roof-crossing were horrible. I rebuilt this part a total of 6x, as I have always tried to mimic the organic curves of the holes. But this resulted in other problems. Too big, unbalanced, not fitting. Finally, I chose these simple square holes. Minecraft is just a "block" game and not a "ball" game. 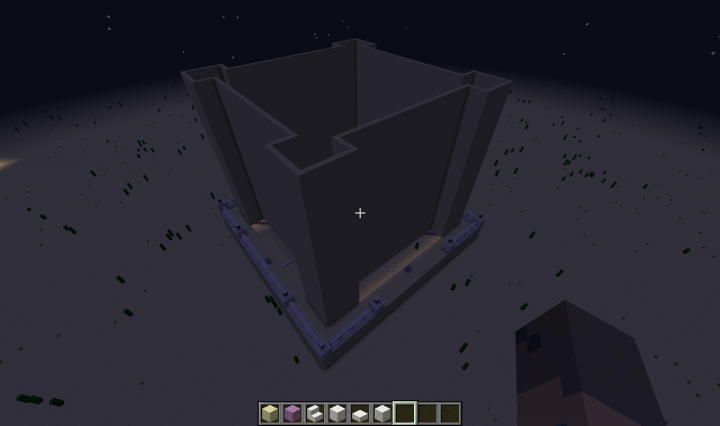 Now the fifth phase has been transferred to all sides and built up a rejuvenation and pulled a bottom roof panel. 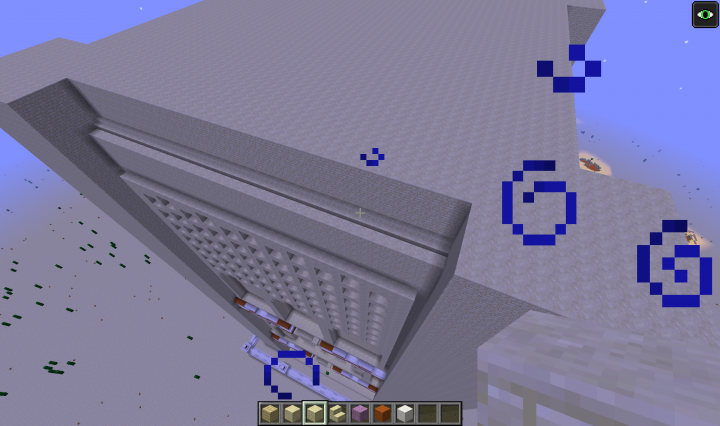 Now the dimensions have been set for the inner spiral staircase with a width of five. The roof walls were also bricked and the cornerstones were completed. Looks like little was but felt the hardest part. The stairs were pulled from top to bottom and walled up only for the first time. Now the rooms have been finalized. The stairs were also bricked down through and the library was also built directly. The inner decoration has already begun. 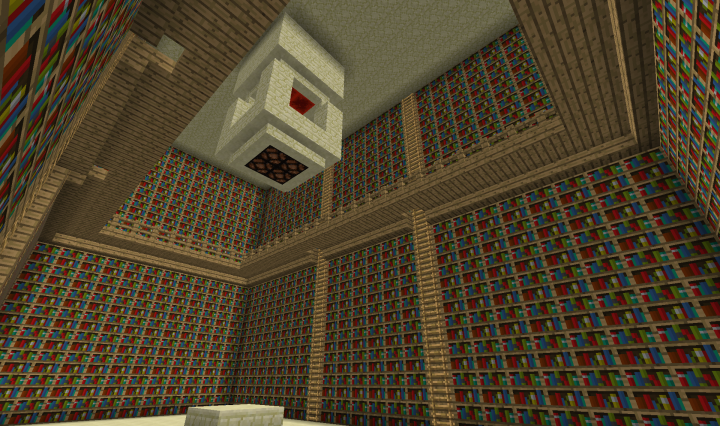 Instead of a portico, I decided to place a large armillary sphere in the middle. Without the debug staff that would not have been so possible. Even lamps have been planned but not yet wired. In all parts of the building, the walls and floors were torn open to lay Redstonekabel. The staircase lighting can be activated from any staircase entrance and also the other rooms as well as the outside tour got their power supply. 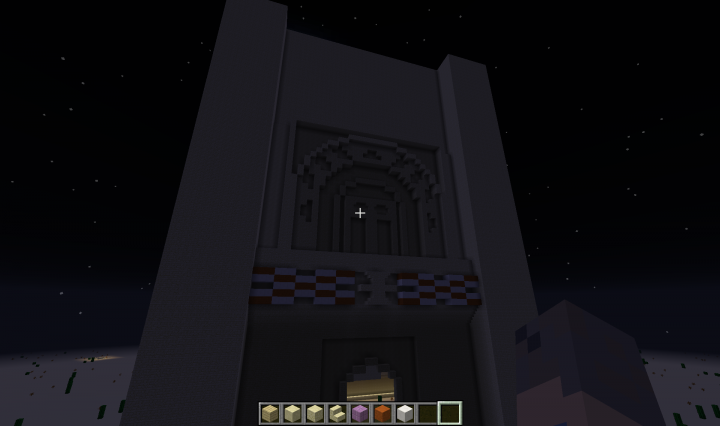 At the entrance there is a wall decoration on the outside for the other walls. I kept it a bit simple and immediately grown on all three sides. Now that I have the shovel in my hand, I will remove the sand around the building to build the space. For contrast reasons, I decided for endstones. 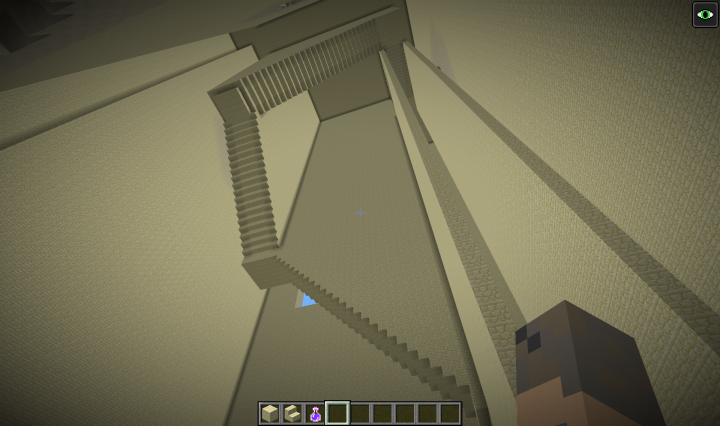 For this I also built the trapezoidal staircase. 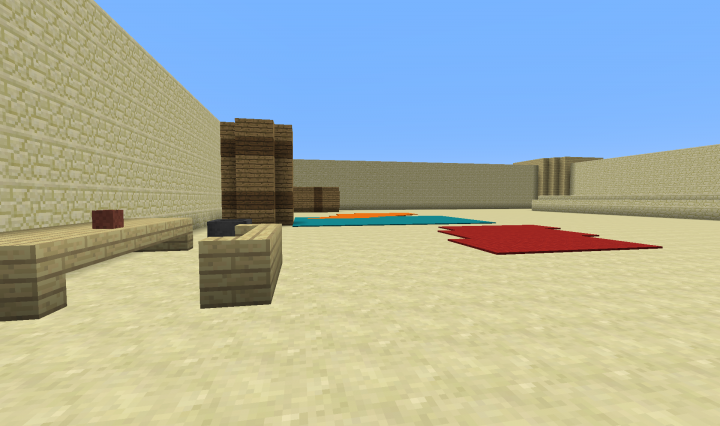 The AoE model also has several deformed columns in the square next to the three rugs. However, I did not want any ruins, so I decided against deformed ruins and instead put down a thinner cylindrical decoration column. 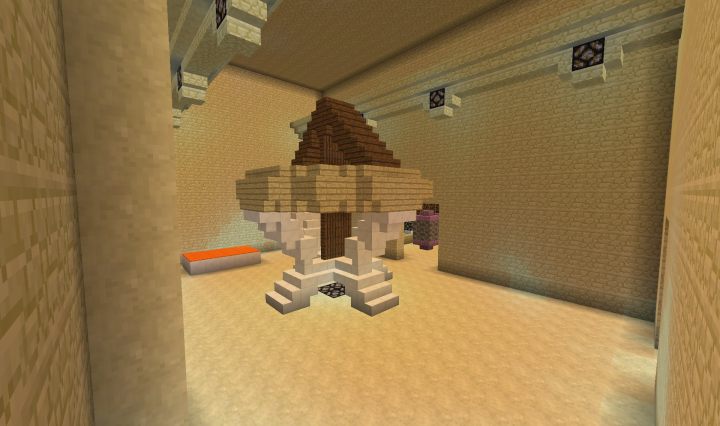 Then I added the roof decoration. Dieses Projekt ist ein Nachbau des Weltwunders der Berber aus dem Spiel Age of Empires von Microsoft mit dem Addon „Afrikanische Königreiche“ in der Teamfarbe Orange. Dieses stellte den „Hassan Turm“ in Rabat, Marokko dar. Errichtet wurde der Turm von 1195-1199. Der Bau das Minecraftmodels begann am 5 August und wurde nach etwa einer Woche fertiggestellt und für den Skyscraper Solo Project Contest von mir hergestellt. Aufgrund der Tatsache, dass McEdit (zum Bauzeitpunkt) keine Kompatibilität mit der neuen 1.13 Version besitzt kann ich weder ein .schematic für den World-Viewer hochladen noch konnte ich den Bau vereinfachen. Das gesamte Bauwerk musste daher Block für Block von Hand aufgetürmt werden. Aufgrund der Größe eignet sich die Benutzung von Strukturblöcken nicht und kann daher nicht ohne Eingriff in die Spieldatein oder beträchtlichen Aufwand in andere Welten exportiert werden. Der Hassan Turm sollte des Minarett der großen Mosche von Rabat werden. Im Jahre 1195 begann der Bau der Moschee mit dem Minarett. Vier Jahre später wurde der Bau nach dem Tot des Almohaden Kalifen „Abū Yūsuf Yaʿqūb al-Mansūr” eingestellt und nie wieder aufgenommen. Das Minarett selbst war auch nicht vervollständigt. Mit gerade mal 44 Metern Bauhöhe war gerade mal die Hälfte der geplanten 86 Meter Höhe erreicht. Wäre sie fertiggestellt worden, so wäre dieses Minarett das Größte seiner Zeit gewesen. Der Baustopp kann als ein Symbol für das Untergehende Almohaden Reiches betrachtet werden. Durch Innere Konflikt auf der Iberischen Halbinsel als auch durch äußer Bedrohungen wie der kurz bevorstehenden entscheidenden Phase der Reconquista oder den aufsteigenden Abdalwadiden schwächte sich das Almohaden Reich immer weiter selbst und auch die Stadt Rabat verlor zusehends an Bedeutung; was sich erst nach der marokkanischen Unabhängigkeit von Frankreich mehr als 800 Jahre später änderte. Eine große Frage während des Baues war für mich, welchen Zweck soll das Gebäude dienen. Zum einen habe ich keine Verwendung für ein Minarett in einer meiner Städte. Ich wollte auch nicht ein weiteres Mal aus einem Minarett einen Leuchtturm machen. Schließlich kam ich auf die Idee aus dem Minarett ein Sternwarte zu machen. Das Gebäude hat neben der breiten Treppe eine Bibliothek, einen Rundgang auf Höhe des schlüssellochförmigen Fensters und eine hohe Eingangshallen in dessen Mitte eine Armillarsphäre steht. Das gesamte Gebäude hat durchgehende elektrische Beleuchtung, welche durch offensichtlich Knöpfe und Hebel betätig werden. Ich mag die Contests von Planet Minecraft wirklich sehr, jedoch hat ich überlegt an diesem hier nicht teilzunehmen, da der Titel „Skyscrapers“ schon ein modernes Gebäude impliziert und moderne Gebäude einfach nicht mein Stil sind. Schließlich hatte ich gesehen, dass das alter keine Beschränkung ist und mir gesagt, „hey da kannst du trotzdem was machen“ und angefangen mir Gedanken zu machen. Ich wollte entweder etwas Passendes bauen, was ich danach auch in der RP-Welt nutzen könnte, oder an meinem Hobby - Weltwunder aus AoE-II oder AoM – weiterarbeiten. Schließlich kam ich auf vier Ideen. 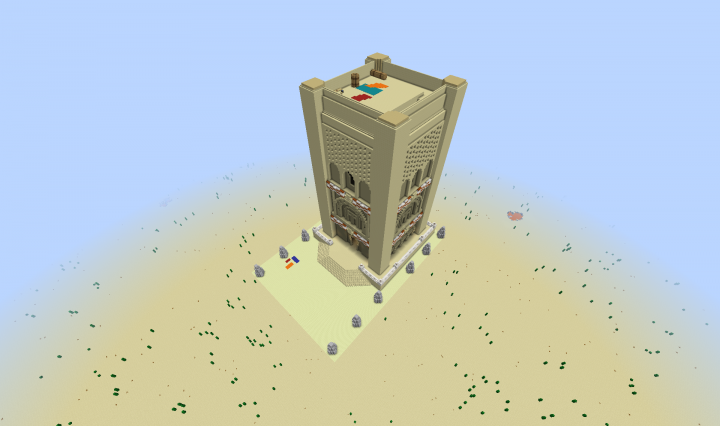 Die AoE Weltwunder der Spanier (Torro de Oro) und Berber (Hassan-Turm), das Kronos‘ Weltwunder „Solaruhrturm“ aus AoM oder der Pharos von Alexandria. Aus ästhetischen Gründen entschied ich darauf hin, dass es entweder der Hassan-Turm oder der Pharos wird. Schließlich entschied ich mich gegen den Pharos da dieser akut in der RP-Welt benötig wird, ich ihn jedoch aufgrund der oben genannten McEdit Problematik nicht auf einer anderen Welt bauen und dann importieren kann. Zu erst begann ich mit der Planung des Fundamentes. Bei diesem Gebäude habe ich ohne Bauskizze einfach drauflos gebaut und mich aus dem Bauch heraus für die Maßen 70x70 für das Fundament entschieden. Ohne McEdit war es nicht einfach sicherzustellen, dass das Skelett auch wirklich ein Quadrat ist. Dafür baute ich dann mit Pupurblöcken diagonale Markierungen um sicher zu sein, dass ich ein Quadrat habe. Anschließend wurde das Fundament hochgezogen auf eine Höhe von sieben Blöcken und anschließend schon der äußere Rundgang sowie das auffällige weiße Geländer gebaut. Nach der ersten Phase ging es darum die Grundmauern auf dem innerem Gebiet von 60x60 fest zu legen. Dabei war das Hauptproblem fest zustellen, wie tief die Wand von den Ecken ein gehen muss, damit später noch genug Platz für ausgehende Dekorationsmosaike und Dekorationen ist. Anschließend wurde der Grundriss auf eine Höhe von 100 Blöcken schon mal nach oben gebaut. Der Eingang ist ein sehr hohes Rechteck. Die Schwierigkeit hier war, dass ich durch das festlegen der Höhe auch die Proportionen des gesamten Gebäudes nach oben hin festlegte. Es war eher ein Bauchentscheidung statt was errechnetes. In dieser Phase ging es um den Teil zwischen dem unteren orangen X bis zu dem Bogenteil. Ich entschied mich das X zwar nicht besonders hoch, aber dafür nach außen der prägnant zu bauen, sodass es stark aus der Wand herauswuchs. Diese Weite hatte ich mehr fach vergrößert. Das wahre Problem war jedoch die Bögen darüber. Auf dem AoE Model sieht man sehr klar verschiedene Ebenen und „löcher“, sodass man hier sehr fein säuberlich arbeiten musste. Am Ende wurde das erbaute auf alle anderen Seiten übertragen. Die drei Bögen und das Fenster war relativ einfach. Die X Stelle konnte ich wie unten bauen aber die Löcher am oberen Ende vor dem Dachübergang waren grauenvoll. Diesen Teil habe ich insgesamt 6x neugebaut, da ich immer versucht habe auch die organalen Rundungen der Löcher nach zu ahmen. Daraus folgten aber andere Probleme. Zu groß, unsymmetrisch, nicht passend. Schließlich entschied ich mich für diese einfachen eckigen Löcher. 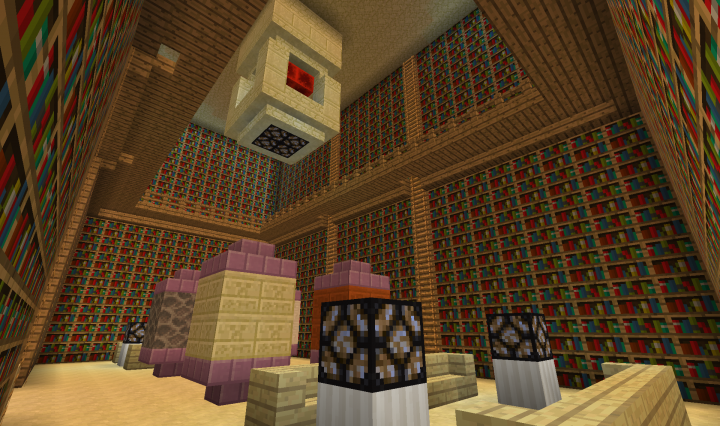 Minecraft ist halt ein „Block“-Spiel und kein „Kugel“-Spiel. Nun wurde die fünfte Phase auf alle Seiten übertragen und nach oben eine verjüng gebaut sowie eine Bodendachplatte gezogen. Jetzt wurde die Maßen für die innere Wendeltreppe mit einer Breite von fünf festgelegt. Auch die Dachwände wurden gemauert und die Eckpfeiler wurden abgeschlossen. Sieht nach wenig aus war aber gefühlt der anstrengest Teil. Die Treppe wurde von oben nach unten gezogen und erstmals nur nach oben zugemauert. Nun wurden die Räume endgültig festgelegt. Die Treppen wurden auch nach unten durch gemauert und die Bibliothek wurde auch direkt gebaut. Die innere Dekoration wurde auch schon angefangen. Ich entschied mich statt einer Säulenhalle ein großen Armillarsphäre in die Mitte zu setzen. Ohne den Debug Stab wäre das nicht so schön möglich gewesen. Auch wurden schon Lampen eingeplant aber noch nicht verkabelt. In allen Gebäudeteilen wurden die Wände und Böden aufgerissen um Redstonekabel zu verlegen. Das Treppenlicht kann von jedem Treppeneingang aktiviert werden und auch die anderen Räume sowie der äußere Rundgang bekamen ihre Stromversorgung. Auf Höhe des Eingangs gibt es außen noch eine Wanddekoration für die anderen Wände. Diese habe ich etwas einfach gehalten und sofort an alle drei Seiten angebaut. Nun nach ich die Schaufel in die Hand und entferne den Sand um das Gebäude, um den Platz zu bauen. Aus Kontrastgründen entschied ich mich für Endsteinziegel. Dazu baute ich auch die trapezförmige Treppe. Das AoE Model hat auf dem Platz neben den drei Teppischen auch mehrere deformierte Säulen. Ich wollte jedoch keine Ruinen haben sodass ich mich gegen deformierte Ruinen entschied und stattdessen eine dünner werdene zylindrische Dekosäule hinstellte. Anschließend fügte ich noch die Dachdekoration hinzu. Nice line. We feel you've given this project some thought. Nice work. I always try just to build withour make many thought; but it never works. I want to build all aoe 2 wonders so I do but I also want to use them in someway for my RP-World so I always think what I could use it for when I have not need for the real thing behind.